This edition of the Mensch Report features my visit at TriCounty Active Adult Center in Pottstown, PA. During my visit, I met with Executive Director Brian Parkes as we discussed the services the senior center provides. In addition, we reviewed their meal program and the various exercise and wellness programs that they offer. Next month, I’ll be hosting the “First Step Seminar” to provide information on starting a business. The seminar will be held October 19, 2 p.m. to 3:30 p.m. at the Lehigh University Small Business Development Center, 56 West Fourth Street in Red Hill. 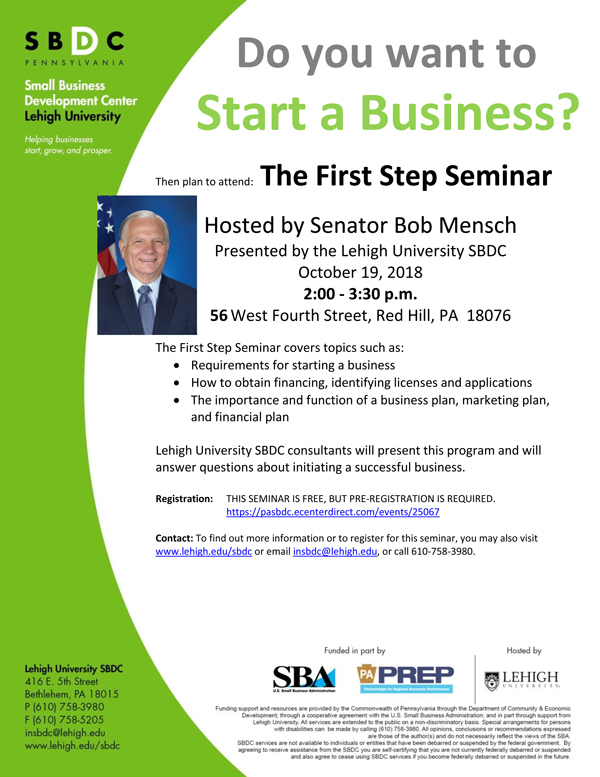 Lehigh University SBDC consultants will present the program and will answer questions about initiating a successful business. The seminar is free, but pre-registration is required. To find out more information or to register for this seminar, you may also visit www.lehigh.edu/sbdc, email insbdc@lehigh.edu, or call 610-758-3980. Work has begun on transforming the Commonwealth’s incremental budgeting system as a result of legislation, Senate Bill 181. Now known as Act 48 of 2017, it requires the Independent Fiscal Office (IFO) to work with state agencies to conduct systematic analysis of programs that is based on performance measurement and established benchmarks with the potential to reallocate funding from programs that do not work to those that generate positive outcomes. The IFO will use information gained from these reviews to develop performance-based budget plans for each agency. Act 48 requires that each Commonwealth agency be subject to a performance review every five years. This review process has just begun for the Department of Criminal Justice, the Pennsylvania Commission on Crime and Delinquency, the Juvenile Court Judges’ Commission, the Department of Banking and Securities and the Department of General Services. In addition, the IFO will also conduct reviews of the Film Tax Credit, the New Jobs Tax Credit and the Alternative Energy Production Tax Credit. The IFO will spend the next few months assessing agency performance and will present its performance-based budget plans to an independent board comprised of the Secretary of the Budget and the Chair and Minority Chairs of the Appropriations Committees in the Senate and the House of Representatives. The plans are expected to be presented in January 2019 and will focus on performance in fiscal years 2017-18 and 2018-19. PennDOT says drivers can apply for REAL ID pre-verification at driver license centers beginning September 1. Under federal law, REAL ID will be required to board commercial flights and enter secure federal buildings beginning October 1, 2020. 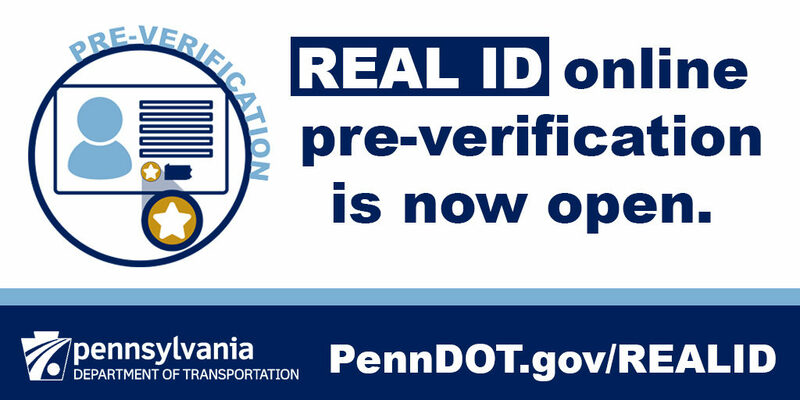 Individuals who received their first PA driver’s license or ID card after September 2003 have had the option to apply for REAL ID pre-verification online since March. Most received their initial product before September 2003, so PennDOT does not have their required REAL ID documents on file. Customers in this group who want a REAL ID will need to bring the required documents to a Driver’s License Center so they can be verified in person. To obtain a REAL ID, customers will pay a one-time fee of $30, plus a renewal fee (current renewal fee is $30.50 for a four-year non-commercial driver’s license or a photo ID). You can find more information on obtaining a REAL ID here. Pennsylvanians are encouraged to report sightings of the invasive Spotted Lanternfly which presents a significant threat to PA agriculture, including the grape, tree-fruit, hardwood and nursery industries, which collectively are worth nearly $18 billion to the state’s economy. The pest has prompted a quarantine on plants in southeastern PA, including Berks, Bucks and Montgomery counties. The action Pennsylvania Department of Agriculture restricts the movement of plants, plant-based materials and outdoor household items out of the quarantine area. 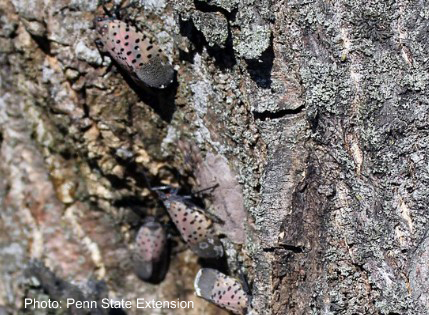 You can call a special hotline at 1-888-422-3359 with questions on spotted lanternfly management or to report a sighting, or report a spotted lanternfly sighting online. Beware of a recently reported mail scam threatening penalties if recipients don’t pay non-existing tax debt immediately. PA residents have recently reported receiving notifications through the mail from the “Tax Processing Center.” The notices say the recipient owes “The State of Pennsylvania” unpaid taxes and a “warranted lien” has been issued in their name. The Department of Revenue will send multiple letters to taxpayers if there is a legitimate liability owed. Pennsylvania’s 72 CareerLink offices provide free services to people who are looking for their first job or seeking a new career and helps connect them to employers who are hiring. You can search by location, job type, salary, work shift and more. You can also find local job fairs, training, workshops and other events in the area. It includes special services for military veterans. Pennsylvania taxpayers can review state contracts worth $5,000 or more via a searchable database. It includes more than 418,000 contracts with Commonwealth, legislative and judicial agencies recorded since 2008, when the database was created. Find contracts involving any real, personal or mixed property of any kind, and any contract for personal services where the consideration involved in the contract is $5,000 or greater.